Earn up to 1,832 reward points. This special-edition reverb features awesome artwork. This extremely limited-edition run of the awesome EarthQuaker Devices Afterneath V2 Special Edition Otherworldly Reverberation Machine Effects Pedal features custom artwork that'll add extra pizzaz to go along with the amazing tones from your pedalboard. 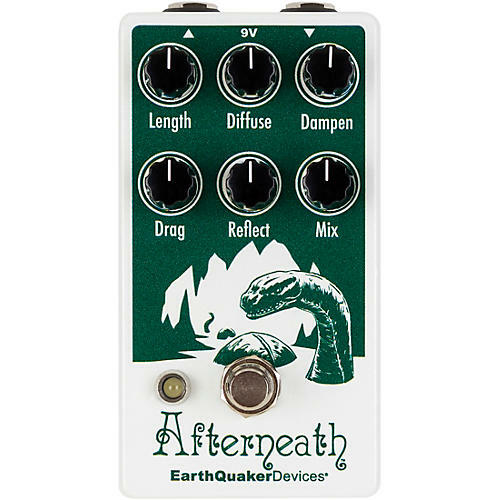 The EarthQuaker Devices Afterneath is an otherworldly reverberation machine that uses a swarm of short delays to create wild and cavernous reverbs and scattered, short rhythmic delays with bizarre characteristics. The reverb created is beyond massive and goes well beyond the territory of most reverb pedals. The controls allow you to stretch, smudge, swell and even self-oscillate into messy ambient washes of sound. The Length control adjusts the decay of the reverb; anything from shorter hall through endless plate style reverbs can be achieved. The Reflect knob controls the regeneration, basically feeding the output back through to create an even deeper otherworldly dreamscape. The Drag control lets you pull the reverb through time by slowing down or speeding up the reverb. The Diffuse knob adds control over spread of the reverb ranging from identifiable attack to a wash of smooth reverb. The Dampen control adjusts the tone of the reverb, both stinging bright tones and warmer swell. The end result is an ethereal, ambient wash that goes from hall to an infinite glitched-out orchestra pit warming up in a canyon at the bottom of another canyon inside a well. The Afterneath is true bypass with an all digital reverb engine, all analog dry signal path and hand made, one at a time in dimly lit Akron, Ohio. Length: Controls the decay length of the reverb. Diffuse: Adjusts the spread of the reverb. Sharper with more attack counter clockwise, more ambient and washy as you turn it clockwise. Dampen: Clockwise for brighter tones, counter clockwise for darker tones. Drag: This digital reverb is made up of a bunch of short delays, this separates the delay lines creating a stuttering, pingy effect. This is the coolest control on the Afterneath, we highly advise slowly turning this while you let notes ring out for a cool warped speed effect. More delay as you turn it counter clockwise, more reverb as you turn it clockwise. Reflect: Controls the regeneration of the reverb, turn clockwise for more wash and echos, counterclockwise for less. This will self oscillate if turned up high. Mix: Blends the wet signal into the dry. Though it does not actually go full wet, it will gradually lower the clean level as you turn it clockwise and give the appearance of full wet.